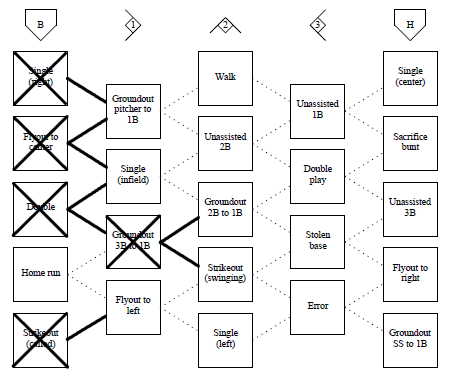 Basepath bingo was developed as a successor to the original baseball bingo in order to address issues with the original game, make it more fun to play, and provide a stronger baseball theme. Each card describes how to play the game, so go ahead and create some cards with the form below. If you would like an in-depth tutorial, one is provided below. 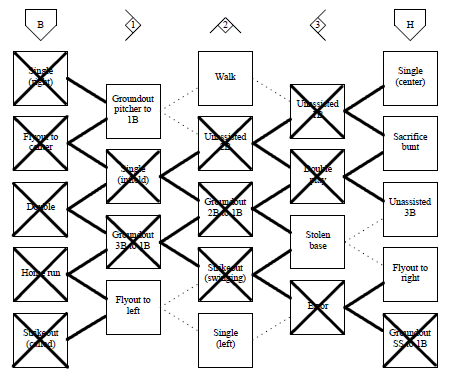 Let's play through the basepath bingo card shown below using the tiebreaker game between the Twins and Tigers for the AL Central in 2009 (game listing). The goal of basepath bingo is to be the first player to check off a square in the final (right-most) column. At the beginning of the game, you may only check off events that occur in the baseball game if those events are listed in the first column. Each time you check off a square, that square will open up other squares in the next column, eventually allowing you to reach squares in the final column. The first play of the AL Central tiebreaker was a flyout to center. This play is on our card in the first column, so we can mark it off. After marking it off, we fill in the two dashed lines extending to the right into "Groundout pitcher to 1B" and "Single (infield)". Those squares are now available to be marked off. The next play was a called strikeout. Again, this play is in the first column, so we mark it off and fill in the single dashed line leading to "Flyout to left". 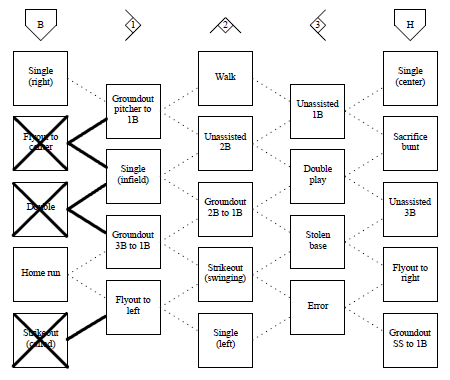 The next three plays are "flyout to right", "unassisted 1B", and "groundout SS to 1B". Since these plays are all in the fourth and fifth columns and do not have filled in lines leading into them, they cannot be marked off as complete. The first inning completes with a double and an unassisted SS pop out. The double is marked off (since it is in the first column) and the unassisted SS pop out is ignored (since it is not present anywhere on the card). At this point, the set of plays that will be marked off on the card if they occur in the baseball game are: "single (right)", "groundout pitcher to 1B", "single (infield)", "groundout 3B to 1B", "home run", and "flyout to left". 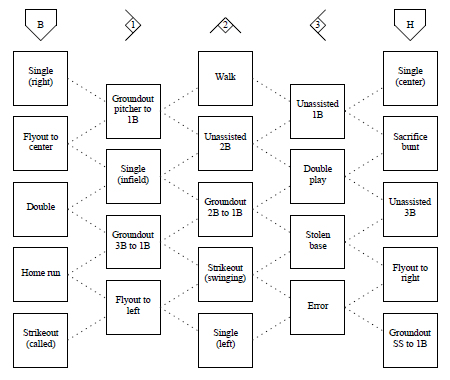 Now the available squares are "groundout pitcher to 1B", "single (infield)", "groundout 2B to 1B", "strikeout (swinging)", "home run", and "flyout to left". The game continues in this fashion, marking off squares that are currently available to make new squares available, until one player can mark off a square in the final column, at which point he or she wins. If we follow our example game to the end, this card will win in the fifth inning when Punto grounds out to short.